Saving the best till last; Mr Porter have launched their final collaborative designer collection for summer 2013. Hot on the heels of their Raf Simons and Ami capsule collections, this time they have teamed up with American designer – and Balenciaga Creative Director – Alexander Wang. Focusing on Wang’s signature minimal aesthetic, the luxe menswear retailer has produced an eight piece collection of t-shirts, sweats, varsity jackets and leather bombers, only available on MrPorter.com. The pieces within the range are effortlessly stylish, with Wang’s trademark use of dark colours, minimal design and clean lines evident throughout. 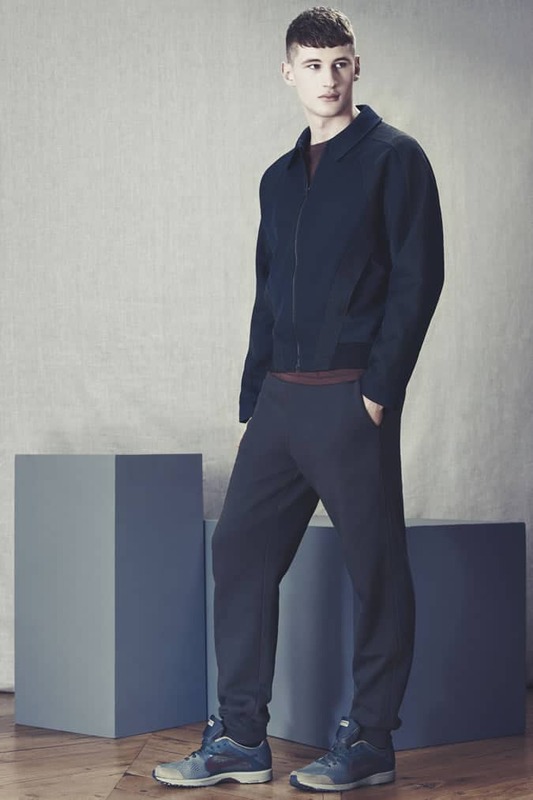 Much of it has a sports luxe feel, epitomised by the tracksuit available. The grey sweatpants are made from tactile cotton-blend jersey and feature a loose fit, along with stretch-blended cuffs and waistband. The corresponding sweatshirt is made from a soft fleece-back cotton-blend fabric. Pair them together for relaxed, lazy weekends around the house or separate them and take your gym wear up a notch. In addition to two casual cotton jersey tees, coming in grey and burgundy, there is a smarter alternative available in the form of the monochrome collared shirt. With sharp contrasting black sleeves this shirt would look great paired with black slim jeans or trousers, creating a sophisticated monochrome ensemble. However, the standout piece has to be the bonded-leather and wool-blend bomber jacket. The all-black piece has a slight box fit to create a powerful, masculine silhouette, and comes complete with a minimal zip front and two pocket detailing. The contrast sleeves gives the piece a contemporary edge, although the timeless colour way and cut will ensure it looks just as impressive for many years to come. The collection starts at £100 and is available now over at Mr Porter.com.